FastBooking officially announces its new GDS connection solution. Built from the ground up, it extends the company’s existing GDS service with its own “FG” chain code, accelerating recognition of the company’s hotel clients on GDS channels. The new configuration also brings hoteliers a single-image platform and leverages the power of FastBooking technology for hotel distribution management. FastBooking, one of the world’s leading e-marketing and online technology solutions providers for the hospitality industry, announces its new GDS connection solution. Beginning with the “FG” chain code, the service interfaces seamlessly with the FastBooking Engine back office to provide hoteliers with a high-performance, single-image solution. “The new FastBooking GDS offer leverages our technological know-how and innovative capabilities across the Internet and GDS spectrum,” says Richard Kefs, FastBooking Executive President. Among the first FastBooking client hotels to adopt the FG chain code are the Groupe Lucien Barrière (France) for seven of its hotels, the Legendale Hotel Beijing (China), and the Hotel Monterey Group (Japan). A key productivity enhancer and massive time saver, FastBooking GDS delivers a veritable ‘single image’, the holy grail of booking engine back office functionality. “FastBooking plays a very important role in the Legendale Hotel Beijing online booking engine. It’s through their technical and excellent support that Legendale Hotel has substantially increased production from online booking….and through their integration process as well as the Single Image advantage that we have received great feedback from our clients and repeat customers,” says Joseph Toh, Resident Manager for the Legendale Hotel Beijing. The same powerful algorithms calculate prices for GDS and other channels. PAR (Prices, Availabilities and Restrictions) rate details are entered in the FastBooking Engine back office, are displayed on the same screen and managed in exactly the same way for Internet and GDS posting, and can be shared with GDS and other channels. All FastBooking Engine functions are available to configure GDS rates: Price sharing,Availability sharing, Room grouping, All price format, Min/Max stay, Overbooking, Close on arrival/departure, Agency commissions, and more. The system is exceptionally flexible when it comes to GDS publishing. Using predefined access keys that simplify and speed the process, hoteliers can manage rates on their own. A single rate can be published as multiple GDS rate codes. A master rate, at parity with Internet rates, can drive all GDS rates. Hoteliers can publish this rate in the GDS as rate code ‘BAR’, equal to the Internet BAR. With FastBooking GDS, hoteliers manage all channel content from a single screen. No need for multiple entries of information or prices. FastBooking GDS ensures the best presentation of the hotel in terms of content such as descriptions, languages and images. Seamless, next-generation connectivity gives travel agents direct, real-time access to hotel data. “This vastly increases their confidence in the hotel when they book rooms for their clients,” says Pierre Charles Grob. 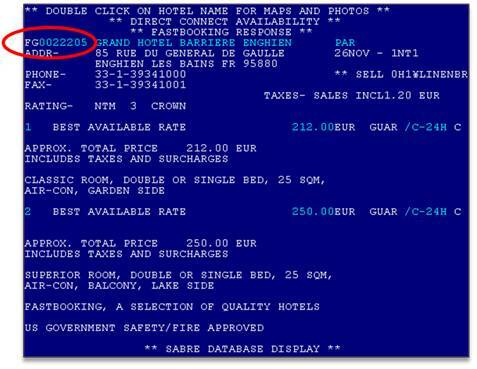 The FG chain code appears on GDS screens, making it easy for travel agents to identify FastBookinghotels. “We ensure a fast response time. We also guarantee commission payments via our partner WPS. These factors are reassuring for travel agents when they book,” says Richard Kefs. FastBooking assists with GDS sales and marketing services by submitting the hotel’s profile to the main Consortia preferred rate programs including, Carlson Wagonlit, BCD Travel, HRG, and others. Additional promotional GDS preferred placement campaigns, partnerships, and other services are proposed in the solution.